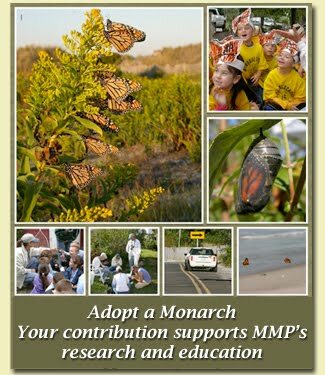 Cape May Monarch Monitoring Project: A Cape May Recovery! All season long we have been busy tagging away around Cape May Point in the hopes that we would receive word that one of our Monarchs had been spotted along the migration route. Today we got our wish! The first recovery of the season!!!! A male monarch PLA 141 tagged by our field coordinator Louise Zemaitis was spotted by another monarch enthusiast as he refueled on a butterfly bush in a yard along the Nanticoke River in Tyaskin, MD. He was tagged here in Cape May on October 9th! He has journeyed about 80 miles south of Cape May Point! Safe travels on the rest of your trip! We're all rooting for you to reach a Mexican Roost! Fingers crossed for more tag recoveries! See you around the Point!